 From the gifted and versatile Walsh (Knowledge of Angels, 1994, etc. ): the comfortably appealing story of a grown woman who, when her secretive mother dies at 84, at last goes back to her childhood to find the identity that had been kept from her. Marion Easton, now in middle age, has never known who her father was--but she does have a distant, half-complete, childhood memory of a seaside cave, of something dreadful happening in it, and of being saved in the nick of time by an unknown man when an incoming tide cut her off from shore. Where was this cave? What really happened? Could the saving-man have been her father? And just how, one might ask, could Marion have reached middle age without--well, asking. But learning what the painter Stella Harnaker was really like as a mother- -and person--helps answer that question. Eccentric, peremptory, demanding, autocratic--and completely, absolutely, utterly devoted to her painting--Stella was a mother who kept the past very tightly corked. Not even her grandchildren, now Marion's two grown children, know who their grandfather was--until, after Gran's death, an unsigned obituary reveals that Stella was once ``a prominent figure'' among the painters in Cornwall known as the ``St. Ives Society of Artists.'' 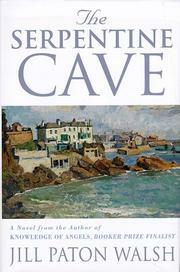 So off to picturesque St. Ives goes Marion, with daughter Alice (a violist with love problems) and son Toby (a broker with suggestions-of-insider-trading troubles), where there will be slow and wonderful unravelings of the past: the house itself that Marion lived in as a child, the half-remembered cave where the tide came in--and, even more important, someone who was there when whatever awful thing it was that happened happened. Be assured it will be well worth finding out, in personal, historic, and human terms all. Pleasant sleuthing, likable people, fine Cornish seascapes, lots of St. Ivesian charm, and plenty of sensible, expert, outright interesting talk about art. Top Walsh, all around.